How can it be Thursday already? Again! Plus it is May, another month has ticked over. This year is flying past so quickly. 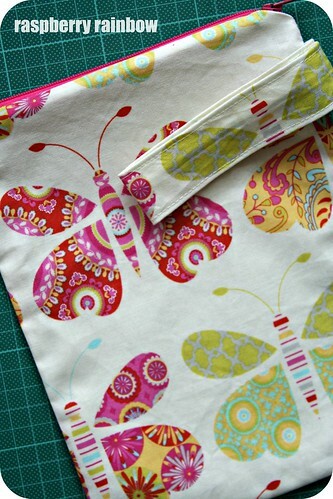 Today, in my creative space, I have one finished butterfly zippered pouch (with a strap) and one more to complete. 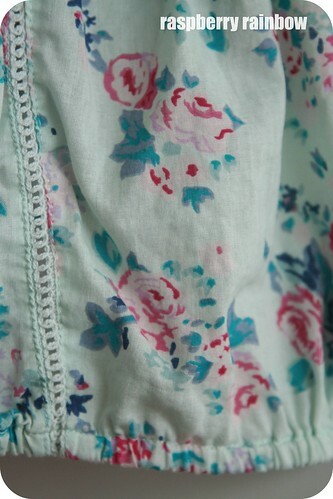 I need to remove the elasticised waist off this pretty new top I bought from Marks & Spencer. The elastic is too tight and not very flattering on me. I love living in a country that has Marks & Spencer! 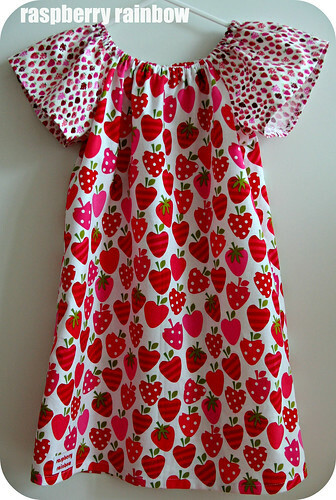 Here is last weeks Strawberry dress, all finished. It was the perfect dress to wear for a fruit themed party at kinder, Abbey loves it. I loooooove your strawberry dress! All of your projects have such pretty fabrics. The strawberry dress is just adorable! Oh that strawberry dress is AMAZING! I love it! I bet Abbey doesn't ever want to take it off. Loving the strawberry dress!! Your butterfly pouch is cute too. Hi Cat, how funny - did you get my email today telling you how much I liked Marks and Spencer when I lived in HK?! Must have crossed in cyber space. The strawberry dress is delicious - was the fabric from down one of the lanes? That strawberry fabric is one of my absolute favourites! Your dress looks just lovely! Stunning collections!!! thanks for sharing blog. you can purchase online party wear punjabi drees materials from G3 fashions surat.